Chinese President Xi Jinping, left, is welcomed by Iranian President Hassan Rouhani during his official arrival ceremony at the Saadabad Palace in Tehran, Iran. China will build two nuclear power plants in Iran and import Iranian oil on a long-term basis. These agreements could threaten Russian interests, because Moscow sought to simultaneously build eight nuclear plants in Iran. Russia's place in the Chinese oil market, which has been squeezing out Arab countries, could also be hit. 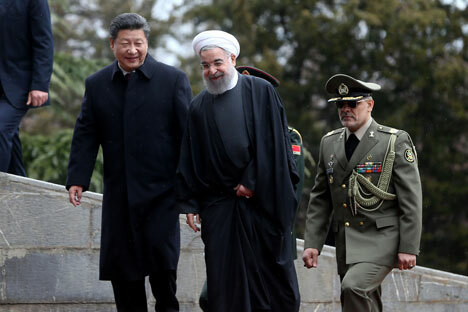 Iranian President Hassan Rouhani and Chinese leader Xi Jinping agreed on January 23 to sign 17 agreements which would, among others, have China build two nuclear power plants in southern Iran and for Tehran to provide crude oil over a long period to Beijing. The 10-year accord will raise the total volume of trade between the two countries to $600 billion, according to the Tehran Times. Rouhani called the meeting “the dawn of a new era” in Chinese-Iranian relations. China has been Iran's leading trade partner for many years. In 2014 trade between the countries was approximately $52 billion and, in Rouhani's words, could exceed $55 billion a year in 2026. The return of Iran to international commerce has sparked a new battle among oil suppliers in the Asian market, where Russia occupies one of the main niches. Iran-China oil supply agreements will not have a direct impact on Russian-Chinese trade relations, according to Ivan Andriyevsky, Chairman of the 2K engineering company. First, Russian oil that is supplied to the East is better in quality compared with to oil provided by Persian Gulf countries. Second, the logistics of supply lines of Russian and Iranian oil do not intersect, said Andriyevsky. This is why Iranian oil will primarily compete not with Russian oil, but with supplies from Saudi Arabia, Kuwait and other regional producers. However, there will be side effects. Due to dumping, Iran will most likely grab a piece of the Chinese oil market from each of its current suppliers. But Asian consumers will not be so careless as to destroy relations with other oil producers for Iran's sake. They know Iran's current price reductions are a temporary phenomenon but also, not taking advantage of such attractive offers in the short-term would be economically foolish. The increase in volumes of exported Iranian oil to the East, coupled with the deceleration in China's fuel demand after its economic slowdown could slightly impact Russia's lasting prospects in the region. By 2020 the annual volume of imported Russian oil in China will exceed 50 million tons, in comparison to the 30 million tons it sent in 2014, estimated Sushant Gupta, an analyst at Wood Mackenzie consulting group, in The Wall Street Journal in 2015. Russia and Iran had close business ties in the field of peaceful nuclear energy long before Xi Jinping's arrival in Tehran, after sanctions on Iran were removed. In fact, Rosatom built the first nuclear power plant in Bushehr. Moscow and Tehran signed a deal in November 2014 for the simultaneous construction of eight atomic power plants in Iran. This was the largest deal in the international atomic energy market in recent years. The 2014 deal includes full construction of a second stage plant in the city of Bushehr with two nuclear units, which could be extended to four, and plans to build four more nuclear units at other sites still to be defined. It is still too early to talk of a Chinese threat to Russian nuclear projects in Iran, but the fact that China won the nuclear power plant tenders is a negative sign, Vashchenko believes. Rosatom said earlier that construction would begin in the fall of 2015. But even though the project has been postponed, it will still be implemented. Citing Ali Akbar Salehi, Director of Iran’s Atomic Energy Organization, the TradeArabia publication on Monday wrote that the construction of the first energy unit of the second nuclear power plant in Bushehr, with Russia's participation, is due to begin in March 2016. The total volume of investment in the construction of the nuclear power plant with its four power-generating units is valued at $11 billion.